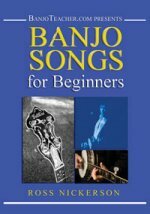 Banjo Songs for Beginners Book(PDF on CD)/DVD/CD set includes fourteen must know banjo classics demonstrated in split screen video at three speeds. The book has easy to read tablature with accent marks for melody notes and both right and left hand fingerings indications. Also included in the book are tips for learning each song, instruction on practicing and using the chords, memorizing tips and other helpful advice to jump start you progress. The book is a PDF file on the included CD. The high quality studio recorded CD demonstrates each song clearly at three speeds for quick and easy learning. The DVD features split screen close-ups of each song at three speeds and has an added feature allowing you to quickly scroll through the songs without having to re-choose the speed you are working at. Worried Man Blues Download now from PlayBetterBluegrass.com! Gospel Songs for Bluegrass Banjo is a collection of classic songs of inspiration. Most songs have been arranged in two keys and in an optional advanced "up the neck" version, providing a terrific insight into how to arrange melodies for bluegrass-style banjo. Fred Sokolow provides demonstrations on the enclosed recording and each song is notated in easy-to-read tablature and standard notation with chord frames.